It is highly agreeable that within the first three years of the NWHL there have been three different Isobel Cup champions. The natural parity of the league is both enticing and even endearing at the same time. It is a good product for those who have long supported the NWHL, as well as those who have just recently caught the itch. The exclamation point was added when the Isobel Cup Final between the Metropolitan Riveters and Buffalo Beauts became a sellout. Successful times in women’s hockey such as we are seeing these days have to bring about pause where we not only look back on where things have come from, but we give thanks to those who got it going. There will only ever be one first NWHL season, and only a select few were inaugural members of the founding four teams. It may sound odd to talk about three years ago as being so distant, but much has transpired between the NWHL’s 2015-16 season and that of 2017-18. There is importance in recalling the league’s initial trailblazers. After all, they gave the league credence to begin with. THW had a chance to get caught up with original Buffalo Beauts defender Kelly McDonald. She was kind enough to talk about those early beginnings of the NWHL, what she has been up to since, and her current thoughts on where the league stands. It was rather nice to get reacquainted with an old friend of NWHL proponents, and we hope that you will feel so too. One of the original NWHLers Harrison Browne just got his name on the Isobel Cup for the second straight season. An original member of the Beauts himself, Browne won the Cup with Buffalo during 2016-17. He then hoisted it again in the league’s third season after coming out of retirement, but this time as a member of the Metropolitan Riveters. Browne also happens to be a best friend of McDonald, and was paramount in the two of them ending up in Buffalo for the first season. McDonald had a very successful career as a Black Bear at the University of Maine. A defender out of Ancaster, Ontario, Canada, she played four years of NCAA hockey in Maine, including her final two years as a teammate of Browne’s. In 130 games for Maine, McDonald compiled eight goals and 21 assists for 29 points, plus 76 penalty minutes. After learning that she had made the squad and would forever be an original Beaut, McDonald compiled an admirable first professional season. Between regular season and playoffs, she appeared in all but one of Buffalo’s games that first year. In her 17 regular season games, McDonald finished third among Beauts’ defenders in scoring with no goals and nine assists. Those nine helpers were second most on the team after a three-way tie for first by Olympians Meghan Duggan, Megan Bozek and Emily Pfalzer who each had 10. Buffalo would ride that support into the NWHL postseason. They finished third overall in the inaugural year with a record 5-9-4 and scoring 56 goals in 18 games. Facing the Whale in the opening round, the Beauts were able to dispel Connecticut in a hard fought, best-of-three series that went the distance. Reaching the championship round against Boston, Buffalo would lose in two straight. The Buffalo Beauts are the only team in NWHL history to have played in each Final since the league’s inception. While they would suffer losses in McDonald’s season with the team and again in the third year, Isobel was all Buffalo’s in the sophomore year of the league. The victory created a love affair between the team and the city that has blossomed more and more ever since. Many of McDonald’s teammates from the first season helped bring the Cup home to the “City of Good Neighbors”. 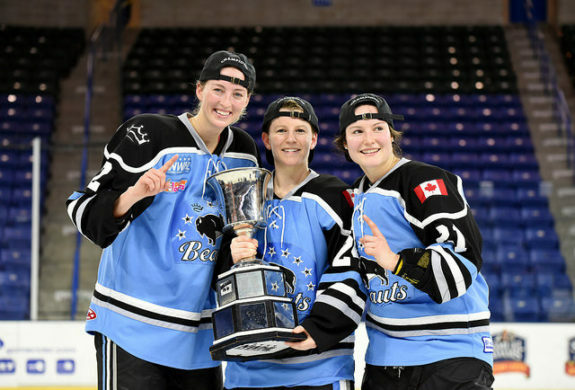 Inaugural Beauts Browne, Pflazer, Bozek, Kelley Steadman, Kourtney Kunichika, Paige Harrington, Devon Skeats, and goaltender Brianne McLaughlin all returned in Season Two to capture the trophy. Would McDonald Ever Lace ‘Em up Again Professionally? After the Beauts won the 2016-17 Cup a number of those aforementioned players retired, including McDonald’s good friend Browne. Oddly enough, some of the retirements would not last very long. Skeats would come out of retirement to suit up for the CWHL’s Markham Thunder for the 2017-18 season and ended up winning that league’s Clarkson Cup championship trophy. Browne’s retirement was shortly lived too. Having announced it in Mar. 2017 after winning the Cup with Buffalo, he joined up with the Riveters that August. Thankfully he did, as it brought Metropolitan their first Cup and Browne his second. Just 26 years old at the time of this interview, McDonald herself is still plenty young enough that she too could put retirement on hold and return to professional playing. It was not surprising when she informed THW that offers had been out there as recent as this season. McDonald is a heck of a good defender and her understanding of the game would be paramount in any defense corps she would be part of. “I was actually asked by a number of people to go out for the CW this year,” she shared, “but I really wanted to commit to coaching. That’s where my involvement with hockey is now and I am very happy with it. Plus, it was hard enough recovering from that year off between University and the NWHL – I don’t think I my body could handle doing that again,” she half-joked, half-seriously stated. So let’s talk a bit about McDonald’s coaching, especially since this is where her passion lies and where she is already helping to foster youth. It takes a special person to become a coach and a special person to be a teacher. Interpersonal relationships, imparting knowledge, teaching a skill to others – these are not natural undertakings for everyone. These are important matters of both the heart and the mind. McDonald is an integral educator at Everest Academy in the Toronto-area. It is considered one of the fastest growing K-12 private schools in the nation, and it promotes excellence among sports, music, arts and academics among its student populous. Outside of teaching, McDonald coaches and assists young women in one of the top women’s leagues for young girls throughout the world. Current NWHLers including Kelly Babstock, Cydney Roesler, Hayley Scamurra, and a number of others are PWHL alums. It is obvious when conversing with Kelly McDonald that not only does she still follow the NWHL very closely, but that it remains near and dear to her heart. Furthermore, she is all for the betterment of women’s hockey if you have not gathered that by yourself already. Whether that is supporting a best friend in Harrison Browne, coaching young women who are approaching that apex of where she once played, or being a tremendous educator for young people. McDonald is still very much “growing the game”. She is a prime example of what makes so many women’s hockey players such good people both on and off the ice. THW asked McDonald what she hopes to see for the NWHL going forward. Her point was well-taken. 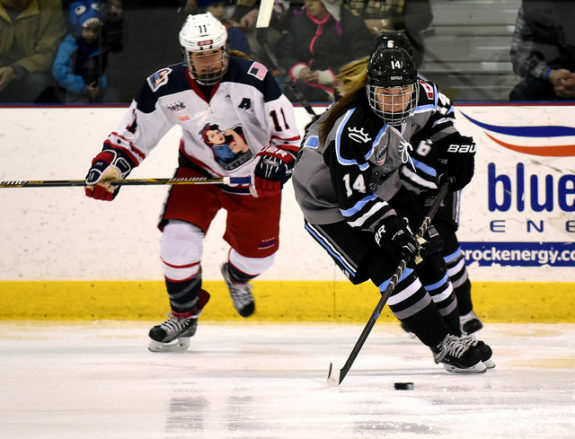 Kelly McDonald leads the rush for the Beauts against the Riveters (Photo Credit: Troy Parla). McDonald speaks from experience. After all, she was a pioneer for one of those two leagues. The experience played a major factor in who she is today. Kelly McDonald helped lay the foundation for many great steps ahead. The best is yet to come.